Some of the heaviest selling texts are now clocking in at over US$100, which is also hefty for graduate students buying a dozen or so books each semester. Until recently, there hasn’t been a lot we can do about this, although not-for-profit publishing houses do offer lower price points (along with all the other benefits publishers can offer, like great editing, and a marketing machine to get your book out there). Now now there are even more options, as new avenues in self-publishing of both e-books and hard copies dramatically change the publishing landscape. The world’s first evaluation e-minibook? This week I have published a low-cost (US$3.99) e-minibook (about 45 pages) based on the content of one of my most recent workshops, which was well received at the Australasian Evaluation Society conference in Adelaide last month, and which I’ll be presenting in an expanded version at my 2-day workshop at AEA in Minneapolis, USA. (h) gives insights that help people figure out what actions to take. Both the workshops and the minibook are a response to two widespread frustrations I have encountered in my travels. Evaluators (myself included) frequently encounter people who think that all there is to evaluation is picking a few indicators and measuring them. On the other hand, clients and other stakeholders are understandably irritated by evaluation reports that swamp them with evidence but leave them none the wiser about how worthwhile the outcomes really were or whether the entire program (or project, policy, etc.) was in fact a complete waste of time, effort, and money. At one level, we can understand managers’ needing direct answers to their important questions – and trackable progress they can visualize. But how can evaluators deliver on that without massively oversimplifying the richness we see in project, program, and policy design, implementation, and outcomes? (6) answers and insights that are actionable, that we can do something with. Availability, audience, and a BONUS for those who post a review! This short (about 30-page) minibook is available on Smashwords in a range of formats including PDF, ePub, mobi, etc., so you can read it on a PC, Mac, iPad, smartphone, Nook, Kobo, Palm, other e-reader – or print the PDF. It is also available from Amazon in Kindle format, which you can also read on an iPad, laptop, or PC (with a free downloadable Kindle app); or with no additional software using Amazon’s cloud reader. THe Kindle version isn’t printable. 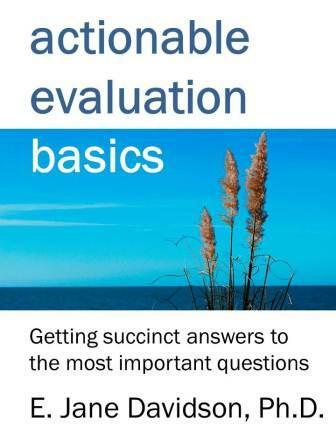 Actionable Evaluation Basics is primarily intended for people who are relatively new to evaluation, or who have been unhappy with many of their evaluation experiences (as evaluators or as clients) and are looking for practical ideas. If you like this minibook, please hit ‘Like’ on its Amazon page, and of course do what all genuine evaluators would do – write a review on Smashwords or Amazon! And of course if you don’t like it, say why – and with the wonders of e-publishing, the concerns can be responded to in an updated edition (update availability is far better on Smashwords, by the way). I’ve already made one revision after critiquing my own work, but there is no substitute for fresh sets of eyes on it! If you contact me, let me know you’ve posted a review, and ask, I will send you a FREE copy of an earlier example of my work! This bonus item for reviewers is a short piece that blends organizational learning, theory-based evaluation, and evaluative rubrics (this time drawing on a mix of quantitative/survey scales and qualitative/open-ended evidence). It’s a PDF of a keynote I did for GIOP, the Gateway Industrial and Organizational Psychologists in July 2002, entitled, Assessing “Organizational Intelligence”: An introduction to the Organizational IQ Test. Actionable Evaluation Basics in other languages? I’ve had some preliminary conversations with evaluators around the world about translating this minibook into Italian, Spanish, German, Bahasa Indonesia, and some other languages. If anyone can see a demand for these or other languages (French, Arabic, Japanese, …? ), please post a comment or get in touch! More information about Jane’s work is available on her Real Evaluation website (recently revamped with the help of visual design guru Stephanie Evergreen of Evergreen Evaluation). How can I get a copy of your new book ? I am working on getting a print version available too; that’s likely to be November, as is the Spanish version of the e-book. Thanks for reminding me to update this post!